On a day where The FA spent the afternoon telling the media about their plans for the future of the women’s game, on the pitch England once again stalled and fell to their second home defeat in a row for the first time in just over four years. Despite England struggling to create meaningful chances and once again looking susceptible at the back, the mood was surprising post-match, with Neville describing himself as “relaxed” and “happy,, while Nikita Parris — one of England’s better performers — claiming the Lionesses “dominated” the match. The reality appeared somewhat different, at least from the stands. Neville’s side mustered just two shots on target as the long-standing issue of goals — or lack of them — in big games once again reared its ugly head and when the goal came it was once again a cross into the box that was England’s undoing. Christine Sinclair incredibly continued her record of being the only player to score for Kenneth Heiner-Møller’s side this year but it was clear to see why Canada has yet to concede a goal in 2019. It was Sinclair’s 180th international goal and moved her a step closer to Abby Wambach’s all-time record, but Neville will be more concerned about how his team failed to deal with Janine Beckie’s cross and failed to react to Nichelle Prince hitting the crossbar as quickly as the 35-year-old. England continued to look like a team that doesn’t quite know what it is, but given their form going into the 2015 World Cup was similarly iffy, there are reasons to not be too pessimistic given this certainly wasn’t the team that will start the first game in Nice against Scotland in two months. But as much as England’s rise from the poor performance against Sweden to end 2018 to winning SheBelieves Cup last month, it was equally baffling to see the reversal from a side which attacked with fluidity in the United States to the side that could barely get in their opponents’ box at the City Academy. “When we lost against Sweden I wasn’t happy,” said Neville. “Tonight, I didn’t think we deserved to lose, first and foremost. I thought it was a brilliant game in terms of the test we wanted. They had great experience and we knew they were going to test a couple of formations. 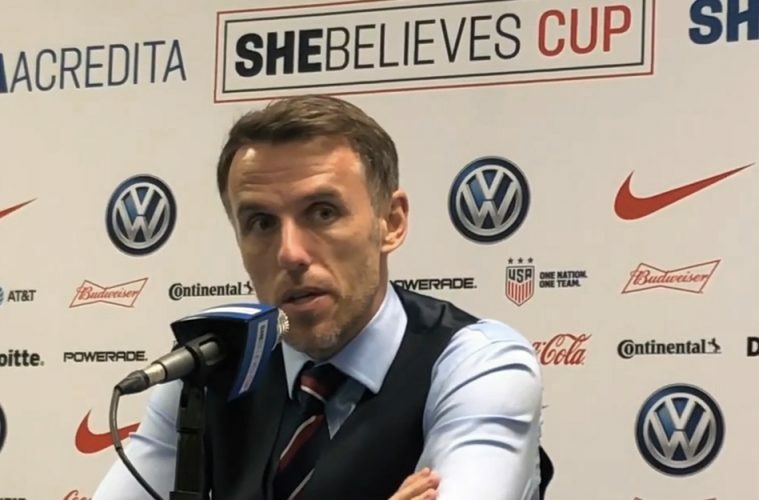 The Lionesses, though, showed none of the attacking quality that helped them secure their first silverware in four years and Neville’s team selections continue to raise eyebrows ahead of the World Cup. This is the second tournament in a row the national team manager has experimented with Lucy Bronze, arguably England’s best player, by once again starting the right back in a center midfield role. Rachel Daly was at right back and Toni Duggan played in the No. 10 role as opposed to the creative Karen Carney, who had a quiet evening out on the left wing. Nikita Parris was by far England’s most creative spark, causing problems for Allysha Chapman from the first 30 seconds, the Houston Dash defender fortunate not to receive a second yellow card for what felt like her umpteenth foul on the winger. Chances were few and far between for both in the first 45 minutes but it was the visitors who looked most comfortable in possession. England appeared only too happy to give the ball back to them and struggled to retain the ball, with Duggan unable to impact the game and Jodie Taylor barely getting a touch during a frustrating opening 45 minutes. The midfield two of Bronze and Keira Walsh once more looked overrun by a midfield three, both Sophie Schmidt and Jessie Fleming constantly able to find space and time on the ball, an issue which has lingered on the surface during Neville’s time in charge. Neville said on Thursday he felt his side had “neglected” the striker at times during his tenure so far, but on the evening he lamented his team’s ability to get Taylor involved, particularly during the first half. “In the first half, Toni and Lucy tried to play the balls we were looking for but we didn’t control and didn’t get Toni in the position as a number ten to turn and break the line. Neville confirmed he’d continue to use Bronze in both a midfield and defensive role, but it’s hard to shake the feeling England is wasting their top talent and looked more threatening after Bronze returned to her right back role with 20 minutes to go. England did look more threatening after the break, only Parris had drawn a save from Stephanie Labbé in the first half but England ended the night having had just two shots on target. Duggan rolled an effort wide and the hosts did generally look more threatening until Sinclair pounced like Sinclair does to seal the victory for the visitors. The Lionesses tried to respond but in reality, never truly tested Labbé as the clock ran down. White did break the lines once and briefly claimed for a penalty which the referee never particularly looked interested in, Neville himself admitting England was “clutching” a little when it came to their appeals. The result and performance now raises more questions for Neville, questions which had briefly gone away after a successful SheBelieves. His side afforded Canada far too much space on the ball, something they can’t do against Spain on Tuesday and a team who is only too happy to knock the ball around for fun. But despite the defeat, the head coach remained in a positive mood as attention now turns to Swindon on Tuesday night. “We’re heading in the right direction,” he said. “Against Sweden, we deviated from the plan. Tonight, they stuck to it and it gives me belief they believe in my philosophy. He added, “I said to the players we shouldn’t lose the feel-good factor just because of the defeat. We want to win every game, I’ve never seen them so disappointed because they’re used to winning. They probably don’t know how to feel tonight, how to digest their performances but they’ll come to realize this is just another part of our journey.